I seem to have hit a blogging slump. I’ve sat down to write countless times in the past week, but all I do is stare at the blank sheet of paper, waiting for words that just won’t appear. Last night I finally gave up and instead of blogging I sat in front of the TV with The Husband and watched Battlestar Galactica while eating mango salsa with a spoon. Well, maybe that’s a slight exaggeration. We ate the mango salsa served with swordfish for dinner, but it was so good that I sat in front of the TV watching Battlestar Galactica and fantasized about eating the leftover mango salsa with a spoon…straight from the tupperware. …OK, maybe now I understand the slump. Anyway, enough about that. 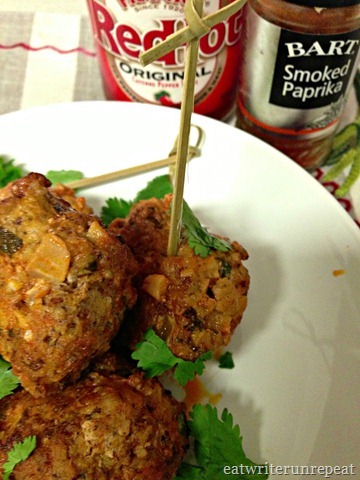 Let’s move on and discuss these Buffalo Chicken Meatballs, mmkay? These babies came about as a result of the pound of ground chicken in the fridge that was about an hour from spoiling, and my deep love for Franks. Again, I know. Deal with it. So I pulled together a mixture of what we had in the fridge and combined it into meatballs while The Husband melted some ghee in a pan to add with the Franks. Beautiful, huh? 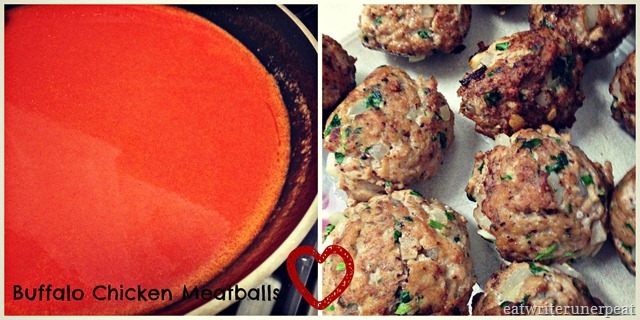 We fried the meatballs first to brown them before tossing them into a baking dish and covering them with sauce. You could easily make these on the stovetop but because the meatball mixture was kind of wet, I was worried they’d fall apart in the pan. Twenty minutes later we had beautiful brown meatballs with a kick of heat! We served ours with a side of roasted vegetables and a baked sweet potato, and of course plenty of leftover sauce! And a side note? The longer these sit, the more of the Frank’s flavor they retain – my lunch the next day was awesome. Preheat oven to 350 degrees. In a bowl, combine first 8 ingredients and mix well. Using your hands, form meat mixture into uniform sized balls. Heat 2 tbsp olive oil in a skillet over medium high heat and brown the meatballs on all sides – you may have to work in batches depending on the size of your skillet. Line the meatballs in a baking dish. Meanwhile, heat 2 tbsp ghee in a saucepan and add the Frank’s – as much as you want, but at least one cup (you want enough to cover the meatballs evenly in the baking dish). Combine until heated through and pour the sauce over the meatballs. Bake in a 350 degree oven for 20-30 minutes, until meatballs are cooked through. 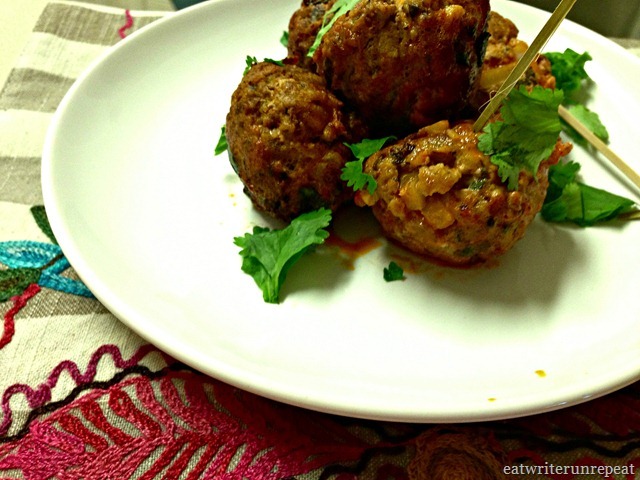 As usual, I’m linking up with Vegetarian Mamma for Gluten Free Fridays! Stop on over to check out other gluten free recipes! 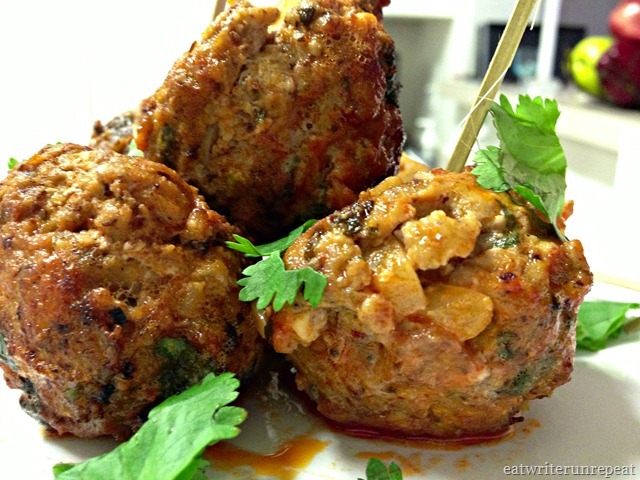 Posted on 6 September 2013 1 October 2015 by BeePosted in Chicken, Dinner, Musings, Whole 30Tagged buffalo chicken, dinner, Franks, meatballs, musings, Whole30.